As I’m getting back into running, I decided to treat myself to an ‘early Christmas present’ (there seem to have been a few of these). Run4it have an offer on just now on their Garmin Forerunner 110, so I splashed out on one with a heart rate monitor. I’m not normally impressed with techy stuff, but this thing rocks my socks. I knew it had GPS, so I knew it would be able to track my overall distance. I wanted this for the Christmas holidays as I’ll be in Australia (where the sun doth shineth!) and don’t know what gym classes/gym access I’ll have, so I planned on running quite a bit. I obviously also knew that it had a heart rate monitor, but didn’t realize that once you uploaded data to a Garmin Connect account, it displayed a graph showing your heart rate throughout your activity. Garmin Connect also displays a map with your run (if you run outdoors with GPS on), along with elevation, average speed and splits. 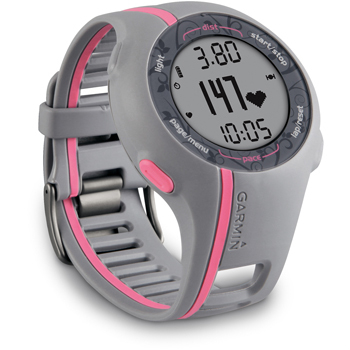 While you’re running it shows speed, distance traveled, pace, and/or heart rate, depending on the display. I have spent so long playing around with my new toy, it’s unreal. I even use it for my gym classes as it tells you (roughly) how many calories you’ve burnt. Not necessary, but interesting! The one niggle I have with the Garmin Forerunner is how you connect the USB cable to the watch; it’s a bit fiddly and doesn’t always get recognized by my laptop straight away. Sometimes I need to jiggle it about for a while before it gets picked up. Apart from that, money well spent. Although I’ve been looking at the fancier versions….. This entry was posted in Kit, Training and tagged 210, forerunner, garmin, gps, heart rate, pace, running, speed by MedalSlut. Bookmark the permalink.